The names Kleenex, Band-aid, Duct tape, and Aspirin all are somewhat interchangeable with the category of products they represent. In a parallel universe the manufacturers would greet this with unbridled joy. After all, you need to capture a lot of mindshare to have your brand name (Band-aid, for instance) stand in for the product category’s name (adhesive bandage). But unfortunately, after a certain level that success is a bad thing because of our legal system. In U.S. law, as well as in many other countries, once a brand name has come to represent the category as a whole it loses trademark protection unless the company that owns the trademark takes active steps to counteract the trademark erosion. If they fail, anyone will be able to use their name. In fact, that has already happened to Aspirin.¹ It’s also happened to cellophane, escalator, linoleum, videotape, and trampoline, all of which previously referred to specific brands. It’s also happened to hoover. And jacuzzi… The list could go on for quite a while. What steps can brands take to prevent this genericide? Two examples stick out. 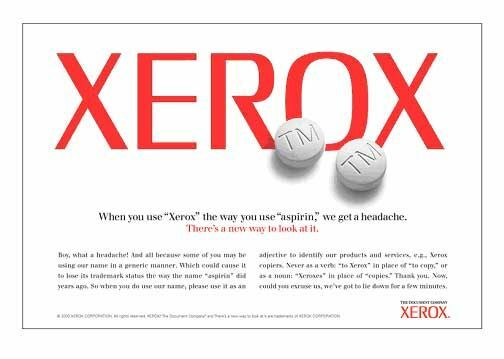 In 2003 Xerox produced an ad that read “When you use ‘Xerox’ the way you use ‘aspirin,’ we get a headache.’” Band-aid also made a subtle change to their jingle from “I am stuck on Band-aids, ‘cause Band-aids stuck on me” to “I’m stuck on Band-aid brand, ‘cause Band-aids stuck on me”. For now those efforts seem to be enough. Most recently this has been an issue for one of the biggest companies in the world: Google. They must have gotten very nervous when the term google was adopted as a verb. Which explains their efforts to keep it out of the dictionary. Eventually, they were successful in getting the Oxford-English dictionary to restrict the meaning of “google” to using the Google search engine only. In the decade since it seems like their efforts were worthwhile as googling something has acquired a much more specific colloquial meaning. One does have to wonder just how successful these companies would like their efforts to be though, because they’re discouraging a lot of free advertising. Because of the split legal system aspirin has become generic in the U.S. but is still protected elsewhere.